There are a few more things to consider when buying an amp, so below are some of the other numbers you see on amp specifications that are very important. Hopefully I'll be able to explain them in the plainest of English possible. THD or Total Harmonic Distortion. This is usually expressed as a percentage and reflects how much 'crap' you will hear. Total Harmonic Distortion is a bad thing in a power amplifier. Its a quality that that you might want in your guitar amp but not in PA amplifier. Whenever you amplify a signal, a percentage of the signal is converted into distortion. This makes things sound louder and more painful than they really are. When this occurs, people put their fingers in their ears. A lot of cheap amps don't even publish their THD figure so be careful. Some of the poorer quality amps you see in music shops have THD's in excess of 1%. At this level, the distortion is highly audible. A good THD rating is closer to 0.05% or less. Noise Floor - Basically, this is how much 'hiss' is in your amp. Its important for amplifiers that will be driving high frequency speakers like horns, if you are a thrash metal band, probably less important, but if you have quiet periods then hiss is extremely distracting. A noise floor is measured in terms of the dynamic range of the signal and might be called either Noise Floor or Signal to Noise Ratio (SNR). Basically it measures how quietly you can turn down the amp before the hiss becomes louder than the signal you are trying to amplify. Try it on your home stereo, play a CD then turn it down slowly until you start to hear a hiss come through the speakers. At the point the hiss is louder than the music, you have reached the Noise Floor. A low number is good, basically we want to be able to keep turning it down and not hearing any hiss. Anything below -100dB (minus 100) is good (so -105dB is better than -100dB). Avoid anything in the 90's. 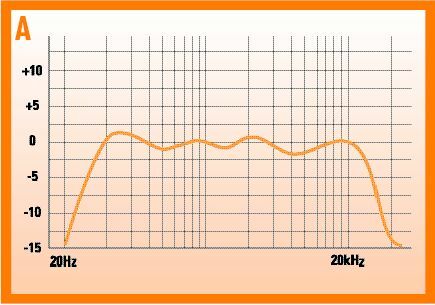 Frequency Response - This describes how accurately the amplifier reproduces all of the various frequencies you send it. It is usually listed as a 'plus or minus' rating. A low number is good. If your amp states it has a frequency response of 20Hz to 20Khz +-3dB. That means that any one frequency may be 3dB louder or quieter than any other frequency. Imagine if 440Hz (middle A on the piano) was 3dB louder than middle C (261Hz) and 1000 Hz was -3dB quieter than middle C. This would mean there was 6dB difference in loudness between 440Hz and 1000Hz. This sounds terrible. A good amp should have a frequency response of +-1dB or preferably much less. Damping Factor - Describes how well an amplifier will be able to actually control the speakers connected to it. This is particularly important for subs. Think about what happens when a speaker moves, a current is put into the the speaker coil and the speaker cone jumps out or in accordingly. Now when that current is removed, the speaker moves back to its rest position, as it moves back through the coil, this generates electricity in the coil which feeds back into the amp. Moving a speaker in and out manually actually generates electricity (just the way a microphone generates a signal, only on a much bigger scale). This signal is actually going to fight what the amp is trying to do to the speaker and the damping factor tells you how likely it is the amp will win the war. An amp with a poor damping factor will cause a fluttery wet bass sound. An amp with a high damping factor will have tight and smooth bass. A damping factor of 400 or more is outstanding and highly desirable. Anything around 250 to 300 is pretty good. Below 200 and you are into the poor category. Slew Rate - determines how quickly an amp can go from one extreme to the other. The faster the slew rate, the tighter and punchier the sound will be. If an amp is slow then the sound will be 'wet' and loose sounding, especially when it comes to bass and very high frequencies. Most people completely ignore this number when they buy an amp. Check out the various makes and models, generally the more expensive amps will have a fast slew rate (reflected as a lower number). Try asking your local music dealer what the Slew Rate of the amp they are trying to sell you is and you will more than likely get an odd look. This is where prior research is critical in making a good amp buying decision. Bridged Mode - This is beyond the scope of this article and I may tackle it some other time. Generally most musicians should avoid bridge mode unless they really know what they are doing. Now go forth and amplify.